Goodnight, Irene is upstairs in the back of the house, with private entrance and entry hall. The room is approximately twelve by twenty-one feet in area. It has a queen size bed, sitting area and private bath with shower. 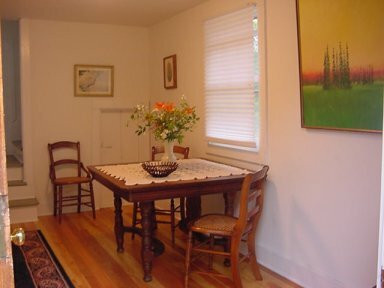 Amenities include wireless broadband internet, basic cable TV, VCR, personal stereo, alarm clock, coffee maker, broiler oven, small refrigerator, iron and small ironing board, dishes and flatware and air conditioning. Large windows overlook the town and give you a glimpse of the lake at one end, and overlook a little woods on the other end of the room.